For most cine lovers, 2016 started off in style with the city launching open the first ever Bimal Roy Retrospective. Known as ‘The Silent Master’ of Indian Cinema, Bimal Roy created a number of classics between the 40’s and the 60’s. The opening evening of the retrospective was flagged off by renowned Director, Ashutosh Gowarikar and veteran actress Shabana Azmi at the Bharatiya Vidya Bhavan, followed by the screening of Roy’s most notable film, ‘Do Bhiga Zameen’. Organized by India’s number 1 stone company – Classic Marble Company (CMC), in collaboration with Bimal Roy Memorial, the retrospective will commemorate the film-maker’s 50th death anniversary by showcasing five of his evergreen classics daily from 11th to 16th January. “We are proud to have become part of this celebration and commemoration of one of the most acclaimed film-makers of all time. Bimal Roy was one of the pioneers of Indian cinema whose work reflected individuality and he brought with him sophistication in the field of cinema art. Individuals of his calibre are few and rare and we feel honoured to have received this opportunity to felicitate his invaluable work,” says Mr. Amit Shah, Director, CMC. The films to be showcased between the 11th and 16th are some of Roy’s best works including Parineeta (1953), Parakh (1960), Sujata (1959), Madhumati (1958) and Bandini (1963). The event will conclude with an award ceremony on the 16th which will felicitate a host of film veterans besides recognizing an outstanding debut film-maker in the Indian cinema. “The association between Bimal Roy Retrospective and Classic Marble Company is filled with inherent brand synergies. 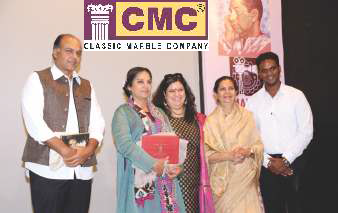 CMC stands for the same values, class and quality that Bimal Roy showcased in his works,” concludes Mr. Shah.